Netflix’s subscriber growth in the fourth quarter is likely to come in below expectations, according to analysts at SunTrust. Although newly released programming like “Black Mirror,” “Bandersnatch,” “Bird Box,” and “Taylor Swift Reputation Stadium Tour” should be able to “close the gap,” the analysts contend meaningful growth for the fourth-quarter is improbable. The streaming giant is set to report quarterly earnings in two weeks. What may turn out to be a lift in subscriber growth from newly released programming like “Bird Box” won’t be enough to give Netflix a strong fourth-quarter finish, according to analysts at SunTrust Robinson Humphrey. Subscriber growth for the final quarter of 2018 through November — for both domestic and international users — appears on track to come in below estimates, analysts Matthew Thornton, Youssef Squali, Naved Khan, and Anthony Duplisea told clients in a note on Wednesday. Two overarching negative factors, rising interest rates and the stock’s lower comparable multiples, led the analysts to slash their year-end 2019 price target from $410 to $355, which still implies upside of about 30% from where shares ended 2018. Other risks to the bull case, SunTrust said, include headwinds from a strengthening U.S. dollar and increased competition from the likes of Disney and Apple.The analysts maintained their “buy” rating. The bank forecasts domestic subscriber adds of 1.43 million to 1.75 million in the fourth-quarter (prior 1.75 million to 1.8 million), and sees total international subscribers of 5 million to 6.9 million (prior 7.3 million to 7.6 million). Still, the analysts cite some positive developments that lead them to maintain their “buy” rating — a strong content slate ramping up into the middle of 2019, including Stranger Things, and a Reuters report that Netflix has hired Activision Blizzard’s former chief financial officer. “Beyond this, we believe the company still has optionality around pricing (lower and higher, depending on market), distribution/partnerships, box office, merchandising, product placement, and licensing out content,” the analysts wrote. 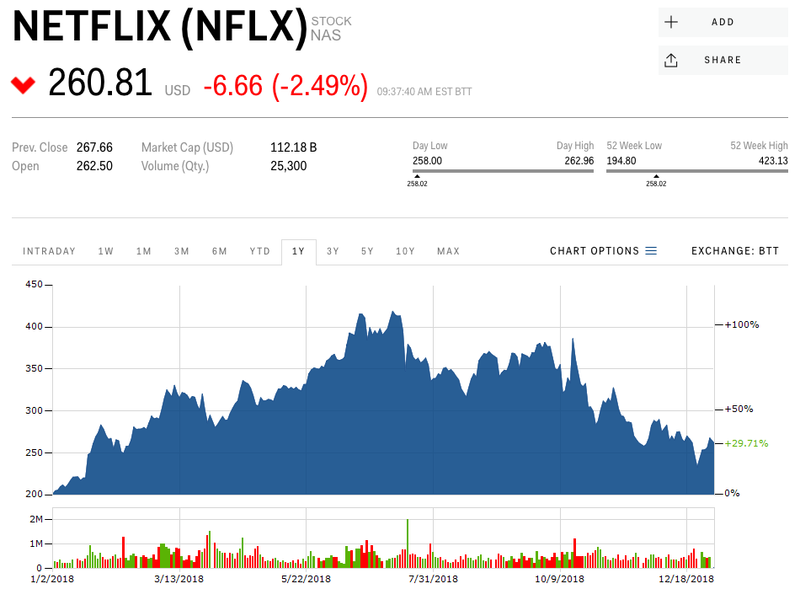 Netflix was down nearly 3% early Wednesday to around $260 a share. The stock gained 39% last year, but was down 36% from its record high of $423.21 set in June. Netflix will report its fourth-quarter results on January 17, with analysts surveyed by Bloomberg expecting adjusted earnings of $0.39 a share on revenue of $4.21 billion.